I’ve had several requests for the wiring diagrams for my Line Source Speakers, so here it is! Basically, all systems like this are wired in series-parallel. Individual drivers are wired in series, then the series banks are wired in parallel with each other. How many drivers to put in series and how many banks in parallel is dictated by the nominal impedances of the drivers, and what you want the total impedance to be. Remember, impedance adds in series, and is the reciprocal of the sum of the reciprocals in parallel (see formula on the image below). In the case of these speakers, I really lucked out… The woofers were nominally 6Ω each and I planned to have twenty of them. The tweeters were 4Ω each and I wanted thirty of them. So it all worked out as shown here. So with four woofers per series bank and six tweeters per bank, all banks add up to 24Ω. 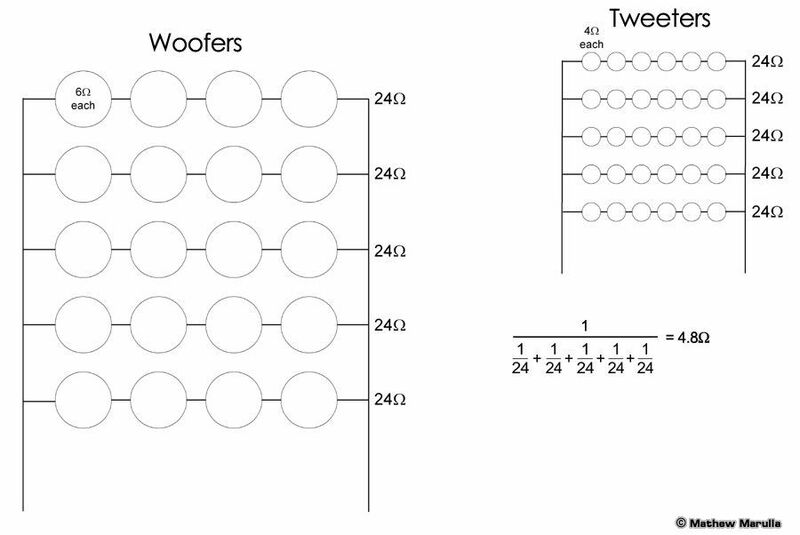 Five of each bank means that twenty woofers is 4.8Ω and thirty tweeters is exactly the same! When doing the actual wiring it helps to make a diagram with the drivers swung into their actual configuration as shown below. Keeps you from getting confused as you connect the wires.